Sign, graphics and visual communications industry's largest trade show runs through Saturday at the Mandalay Bay Convention Center in Las Vegas. The trade show floor sold out months ago; a waiting list for exhibit space included dozens of companies. Registrations have outpaced last year’s strong event, which was the best in a decade. Education registration is the strongest since ISA began tracking attendance at these sessions. Sponsorships and in-kind product donations were the highest ever. The co-located National Sign Research and Education Conference (NSREC), hosted by the Sign Research Foundation, was a sell-out. Because of the success of the most recent ISA International Sign Expo events, ISA will expand the trade show floor in 2018 when the event returns to Orlando. 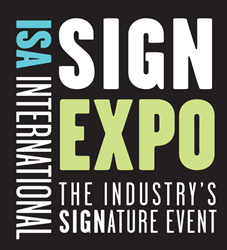 ISA International Sign Expo takes place through Saturday at the Mandalay Bay Convention Center in Las Vegas. Learn more at http://www.signexpo.org. The International Sign Association (ISA) represents manufacturers, suppliers, and users of on-premise signs and sign products from the United States and 60 countries around the world. ISA and its Affiliated Associations work to support, promote, and improve the worldwide sign and graphics industry, which employs more than 200,000 American workers and has an economic impact of $37.5 billion. ISA International Sign Expo is the on-premise sign and graphics industry’s largest expo. Held each spring, the event features the latest products that showcase the breadth of the industry along with education and networking events. The event has been named to the Trade Show News Network’s List of Top 250 Trade Shows and ranked in the Top 100 Largest Events by Trade Show Executive three consecutive years. Learn more at http://www.signexpo.org.